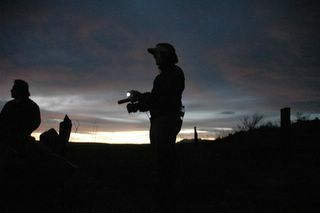 Here's a photo that was taken while we were out legal observing in October. It's the National Gaurd driving down the highway through Hachita, New Mexico. The photo is very relevant today seeing how there is a great deal of talk about putting the National Gaurd on the border. 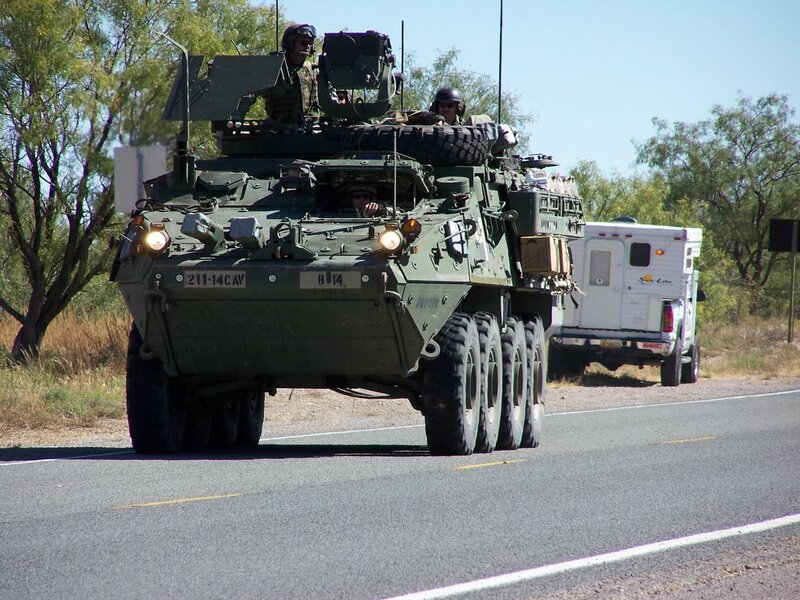 Of course the vigilantes have been crying for the National Gaurd for quite some time, but nonetheless I was quite shocked when Arizona Governor Janet Napolitano (D) called for putting the National Gaurd on the border in her State of the State Speech. Certainly the Governor had some good plans, like charging vehicles with low emissions less to register their vehicles (which makes me wonder how much the Governor's plan would make the tank pay for tags to drive down Highway 80 in Arizona), but calling for placing the National Gaurd on the border was an ill-designed attempt to gather points for her political career. As a Governor with high ambitions to become a National figure, she is certainly taking great advantage of the recent increase in paranoia and fear related to our southern border. Timothy Dunn points out that the doctrine of low-intensity conflict has come home in his book 'The Militarization of the U.S.-Mexico Border.' It appears now that the Governor and other anti-immigrants have gone beyond low-intensity conflict and are calling for an all out war. The impact of Gov. Napolitano's call for the National Gaurd goes beyond bad border policy and demonstrates how our society is quick to see aggressiveness and possible violence as a solution to just about any problem. Whether it be the military-industrial complex or the prison industrial complex, we are quick to use punishment or force as a tool of social control. There are over 2 million people in U.S. prisons and jails, per capita we incarcerate more people then any country on the planet. Last year alone we spent $7.3 billion dollars on border-related expenses and now have more sensors, fences, armed agents, helicopters, and cameras on our border then we ever have in the history of our nation. Certainly there are also practical reasons one would not want the National Gaurd on the border. I remember stopping late one night and seeing a group of about 20 migrants being held approximately 30 yards from one of the tanks. I slowed my car and was going to get out to talk to the migrants when someone in complete camoflauge came running over with a very mean scowl on their face. Before I could explain myself I was told by G.I. Joe to, "get the hell out of here." Seeing as he had the tank and the guns I decided to drive along. The demeanor of this individual was something I had never seen before. With his military fatigues, guns, tanks, and other high powered equipment he was not simply playing war, he was in a war. The fact that he was on U.S. soil and was only a few miles from a city made no difference to him. Say what you want about Border Patrol, but at least there primary training is not to kill. I have run into plenty of rude, racists, and angry Border Patrol Agents, but for the most part I have not got the sense from them that they think they are in a war zone. On May 20, 1997 Ezekiel Hernandez was murdered by a U.S. Marine. The Marines were working with the Border Patrol under the project Joint Task Force Six, hoping to assist stopping drug dealers. Instead they ended up killing an 18 year-old U.S. citizen who was out herding goats. Let's hope that Gov. Napolitano's attempt for political points does not leave another family without a child. Alright Ryan, it took me two months to sign-up for this thing and here goes my first post. I have no idea what to write and spent the last hour looking at other people's blogs to figure out what I am supposed to say. From the blogs I have read I realize I am supposed to try to write something like an op-ed or go on a mindless rant. Since there really has not been much information in the news lately about the border (one wonders if it still exists) it seems as if I have a lack of materials from which to draw from. So, I'll go with my favorite source of material; personal experience. In additon to presenting at this conference, the documentary Crossing Arizona was showing at Mexico City's premeire film festival FICCO (I don't feel like writing the entire name). Along with co-produce Daniel DeVivo and activists Mike Wilson and Kathleen Ferguson, we did a question and answer segment after each screening. I was anxious to meet activists in Mexico City and hear about their work and how we could collaborate, but each night once the theatre lights were turned on all that was in the audience was a see of light-skinned, light haired individuals, many of whom asked their questions in English. If someone had hit me over the head and dragged me into the theatre and then asked me to guess what city I was in, I probably would have guessed somewhere in the United States. I hadn't seen audiences this 'white' since I did a presentation at Iowa State University, a campus which by the way is 98% Anglo. Now you might be asking yourself, were these tourists simply there for the film festival? No, turns out they were Mexico City's own; the privileged and wealthy for whom the possibility of having to walk through the desert for four or five days never crosses their mind. I spent the weekend visiting family and friends in between screenings and hung out in the more upscale neighborhoods in Mexico City, or should I say North America. Polanco, Zona Rosa, Chapultapec Park, Coyoyacan, and Santa Fe were my stomping grounds. Somewhere between the Hotel Sheraton next to the Angel de Independencia and the 'VIPS' restaurant is where my Crackberry Handheld Wireless disappeared, and I am still suffering from withdrawls, but now have a new excuse not to call people, oops, lost my phone and that is where I stored your number. Not really seeing anybody with skin as dark as mine or as big of an 'indio' nose that i have at any of the screenings, and after receiving plenty of stares from the wealthy Mexicans as I walked through their prestigious neighborhoods I wondered if I would have had the same opportunities for education if I had been born a mile to the south of where I was born. On the way to one of the screenings the taxi I was in was pulled over for making an illegal turn. It certainly was not an illogical turn and the no-turn sign was pretty well hidden, but the two police officers were waiting on the side of the road and for the 20 minutes I was there I saw them pull over 5 different cars. After listening to the taxi driver and police man argue for awhile we were finally let go after the taxi driver slipped a hundred pesos (10 bucks) into the palms of the fat pig. Needless to say, the taxi driver was pissed and when I asked him if this was typical, he said yes, that the even the pigs in Mexico City are 'demasiado' corrupt. While I have never had one person recommend actually taking a taxi in Mexico City, I was happy to have many good conversations as I was zipped through town. I preferred to talk because it kept me from thinking about how fast and aggressive everyone was driving. The first taxi drive who dropped me off at the hotel told me he hated the United States and has and never had any desire to live in a country where all they care about is money and everyone is so busy they don't have time to enjoy life. My hotel was right next to the U.S. Embassy and he laughed when I was getting out of the car and told him I was back in the belly of the beast. Another taxi driver expressed the same disdain for the United States. He said the U.S. thinks they are the 'best' and 'strongest' country in the world, and this in turn leads them to be racists towards people who are not like them. With all it's racial problems, congestion, and smog, I was still sad to leave one of my most favorite cities I have ever visited. The amazing architecture, culutral gems, great food and the feeling that you are in New York City on meth is quite addicting and I look forward to my next trip to el D.F. My journey home took me by airplane from Mexico City-Ciudad Juarez. There was not a single empy seat on the flight and the vast majority of people had skin as dark, if not darker then mine, and were dressed in dark clothes and carrying only a small backpack. Though I was one of the last to board i knew I would not have trouble putting my suitcase in the overhead bin. I flew back into Ciudad Juarez and took a taxi back to where I left my car at the El Paso airport. For pretty much everyone else on my flight, I don't think their trip across the border was as easy as mine. When he ain't breaking hearts, here's a young man who is getting his bike on across the border.